A broad evergreen shrub with fine, bright green needles, suited to sun or shade. Dense, easily pruned growth brings structure and texture to the landscape throughout the year. 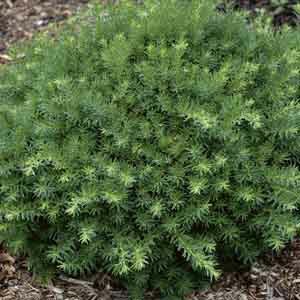 Pairs well with other evergreens and provides shelter for birds. Red berries add to its appeal. A great choice for foundation plantings or hedges. Excellent for planting along fences and walls. Provides dramatic color and form to autumn and winter landscapes. Light, sandy soil with excellent drainage. Very easy to grow in virtually any location. Adapts well to a range of soils with excellent drainage. Water regularly until established. Prune to maintain desired shape.